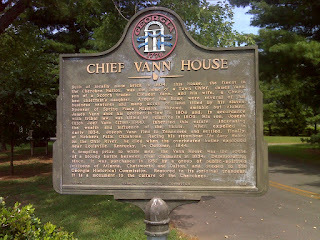 Chief Vann House, a focal point of Cherokee entrepreneurship and success until gold was discovered in Cherokee autonomous lands near Dahlonega in 1828. 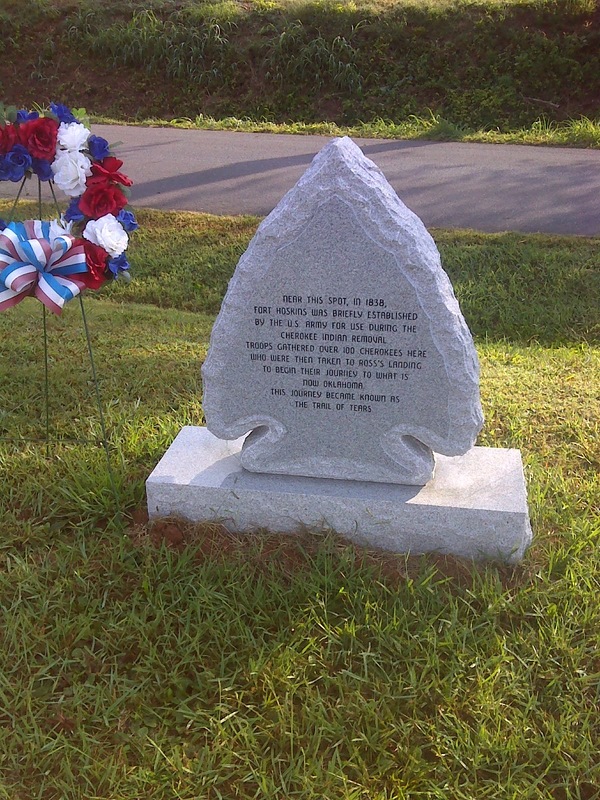 Ten years later, 4000 Cherokee tribe members were killed and thousands more were forcibly evicted from their homes and made to march to Oklahoma through one of the most bitter winters in memory. 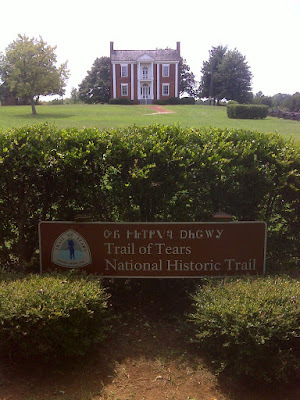 The Cherokee people called this "nu na hi du na tlo hi lu i" -- The Trail where They Cried. My surname is Wetzel, and although I know of no direct relation, the most famous person named Wetzel was an Indian hunter named Lewis Wetzel, who ranged the Ohio Valley in the late 1700's. He was a loner who took pride in his hatred of native Americans. He scalped his victims. The Indians gave him the name 'Deathwind' because of his skill at reloading his rifle while running at full speed. Lewis Wetzel was accused of murdering peaceful native Americans, but he escaped to New Orleans before he could be brought before a court. In the south he spent several years in prison for counterfeiting. In all, this is not a person I am proud to be associated with. 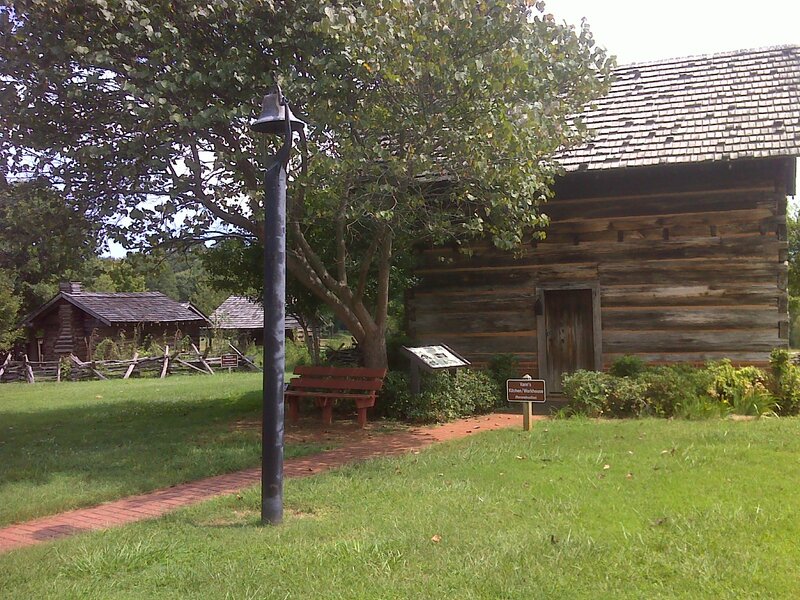 And my walk through pre-1830's Cherokee Nation autonomous territory on the Pinhoti Trail reinforced the shame I feel for the way these people were treated by people of my ethnic background. The 'Indian Removal Act of 1830' began the process of stealing Cherokee Lands and forcibly relocating those who would not assimilate to Oklahoma. 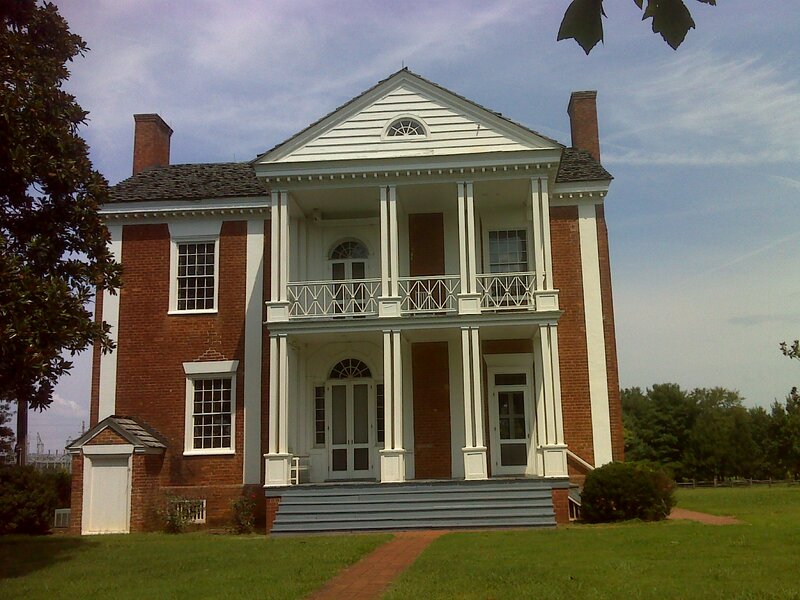 The resulting journey has been dubbed the Trail of Tears because of the hardship the relocation caused. It's beyond the scope of this hike report to go into the history, though it's fascinating and, to me, deeply saddening. This Wikipedia Article, might be a good place to start to learn more. The Pinhoti Trail goes several miles out of its way to visit Chief Vann House--built just after 1800 by a wealthy Cherokee leader named James Vann. 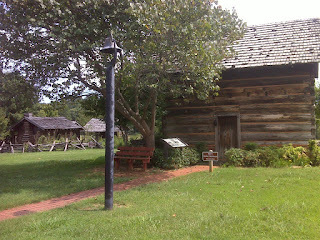 Here's another view, the out-buildings, and the interpretive plaque. 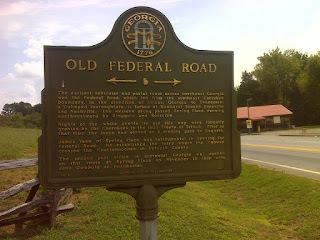 Vann was also instrumental in establishing the Old Federal Road, which the Pinhoti Trail also follows for several miles. 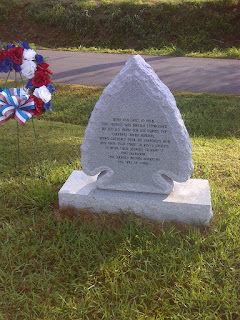 For me, the house, and a nearby memorial also along the Pinhoti trail in the town of Spring Place served to open the door to my awareness of this episode of local history. I'm sure that's why the trail went there, and why it was more than worth the extra few miles. Overall, between Dennis Mill Road and I-75 in Dalton, GA, the Pinhoti Trail follows paved roads for twenty five miles. 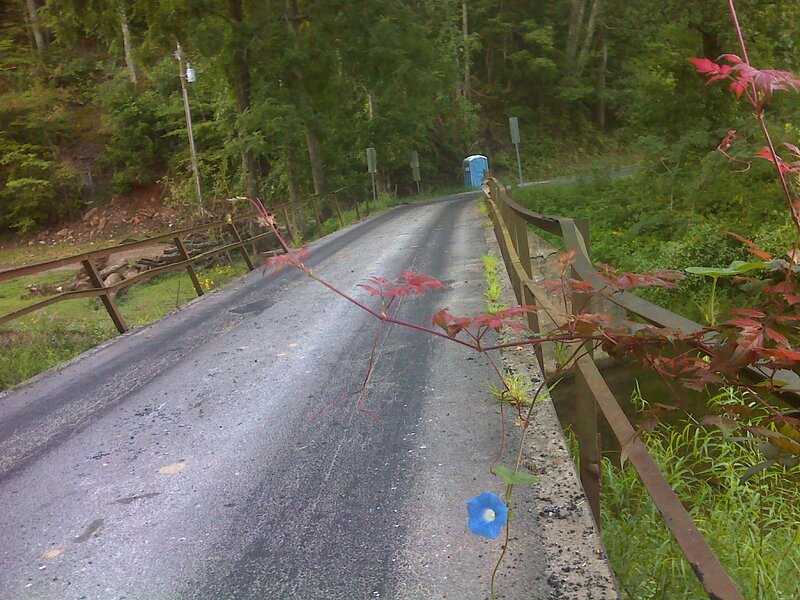 Dennis Mill Road is a quiet country lane, with this creaky one-lane, vine-adorned bridge over Rock Creek. 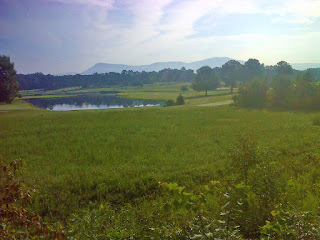 And there are some nice views of the Cohutta Mountains that I just hiked through. 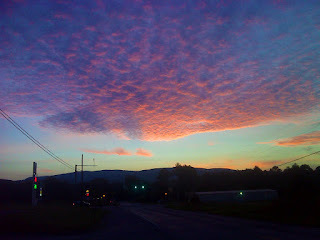 Here's a view at sunrise in the little crossroads of Ramhurst. Fortunately there's a sidewalk here. And I was delighted to see the turns well marked with those big green trail signs with many more of the small white diamond signs at intervals between. 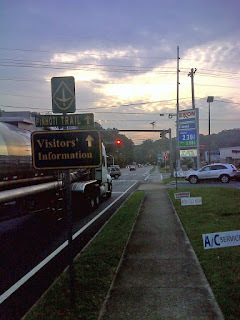 Other trails, including the Appalachian Trail, don't do this good a job of marking their road walk sections. I covered the road walk in two hot days, getting very early starts -- we're talking 4AM -- when the only light was that of the waning moon and the occasional porch light or business. 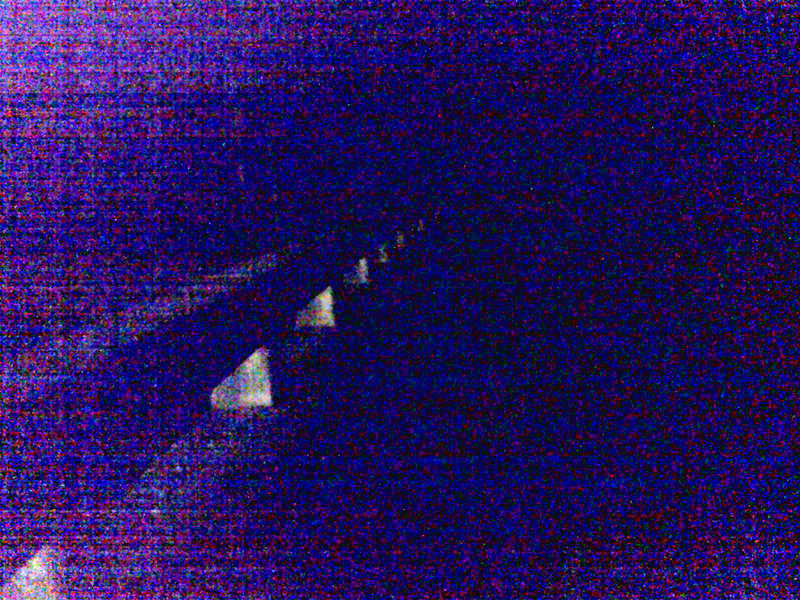 Here's what the bridge over Coahulla Creek looked like to my camera, illuminated by an adjacent gas station. The early start worked. 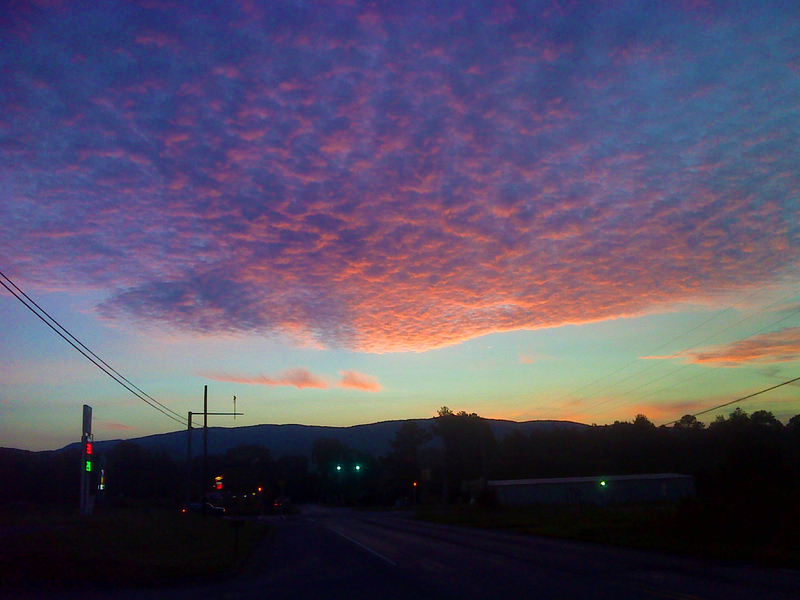 I got the vast majority of my miles accomplished before the temperature reached 80F, though even in the pre-dawn hours the humidity was an issue. I'm taking a break now for a family vacation and to accomplish some business in Florida (in a round-about way, it's the reason I'm hiking to Florida). 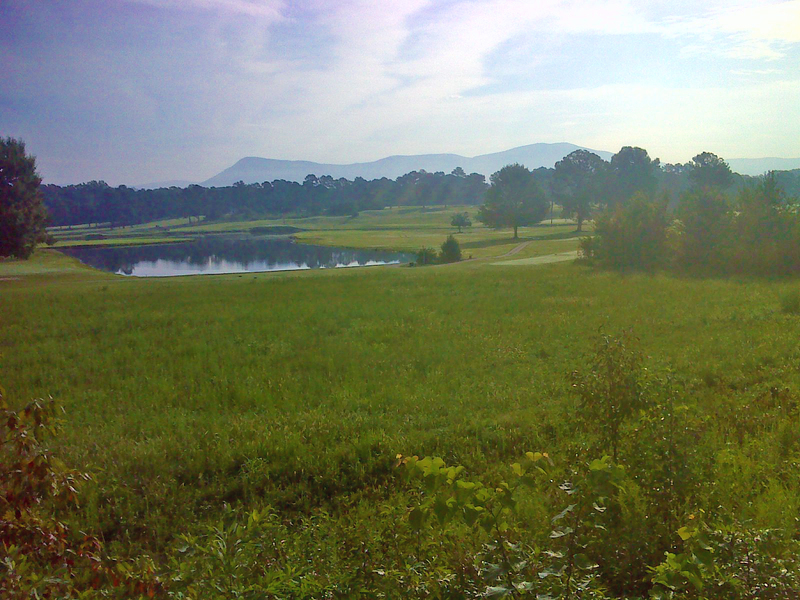 When I get back to Dalton in early October, I'm hoping for a bit more of a fall feel to the air. Stay tuned. A map of the route appears below. I walked one way and used my bicycle for the return trip, dividing the 25 miles into ten small out-and-back segments.